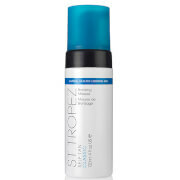 This bronzing mousse from St Tropez is a super-lightweight, easy-to-apply, velvety mousse that delivers the ultra-even all-over tan you’ve always wanted. Infused with conditioning aloe vera and long-lasting colour, you’ll have a perfectly natural looking, streak-free tan that dries in an instant. Our innovative Aromaguard™ fragrance technology eliminates the tell-tale self tan aroma by a minimum of 70% and instead gives a beautiful subtle, yet refreshing fragrance. Exfoliate with St Tropez Body Polish before moisturising dry areas thoroughly with St Tropez Body Moisturiser (elbows, knees, ankles and feet). Help protect light eyebrows and hairline with a little extra moisturiser. Then, pump the mousse into your palm and sweep it from top to toe making sure you’re well covered as it’s only missed areas that can look patchy. Once you’ve got even coverage wait for 60 seconds before getting dressed. Then try not to get wet, or sweat, for at least four hours. Finally, shower off to reveal a perfectly golden, natural looking tan. To maintain, re-apply a couple of times a week, nourish daily with St Tropez Body Moisturiser and smooth with regular exfoliation for ultimate results.